Summary: Evie's shattered ribs have been a secret for the last four years. Now she has found the strength to tell her adoptive parents, and the physical traces of her past are fixed - the only remaining signs a scar on her side and a fragment of bone taken home from the hospital, which her uncle Ben helps her to carve into a dragon as a sign of her strength. I haven't got a copy of the book yet, but it sounds really bizarre and original so hopefully I'll get a chance to read it soon. Alexia has written up a guest post for us, about deciding the best time is to get feedback when you're writing a book. I don’t want your opinion yet! It’s always difficult to decide when to get feedback. Some people say it’s never too early, but I don’t agree. For me, it’s really important not to have feedback too soon. This is one of the reasons I think that the approach a lot of university writing courses take is problematic: they assume that everyone will benefit from sharing their work-in-progress, but it’s just not true for everyone. I find getting feedback too early in the process is both demoralising and frustrating. First drafts are allowed to be a bit rubbish; if you get feedback on one, you have to expect it to be less than fully encouraging. I’m very good at seeing past what’s wrong with my work to what it will be when I’m finished, but I do it in a weird upside-down, back-to-front dyslexic way. Most people don’t approach text in the same way, so what I see as small flaws that I can easily sort out, they see as disaster. As a result, I often get very negative feedback when I show early drafts to people. Take The Bone Dragon. When I wrote the first five pages, I showed it one of my trusted ‘first readers’ because I was so thrilled I just had to share it. I knew it was the best thing I’d ever written, but my first reader hated it, even though she loves the finished book. The experience taught me a valuable lesson and I barely talked about the project again until I had a reasonably advanced draft. When I next asked for feedback, it was both enthusiastic and helpful. The trick is knowing when the problem is that your draft is a mess because you’re still in the early stages of developing it and when the book is doomed. If you’re writing rubbish, it’s probably best to know as soon as possible. Equally, if you’re writing something that will be good, even if it isn’t good yet, negative feedback at an early stage can kill your confidence. It’s all about balance and timing: getting enough feedback, and listening to it, at the right time. There’s no point in getting feedback that tells you what you already know unless you’re asking someone to give you advice on how to fix the problems you’ve already spotted. One of my rules of thumb is to ask for feedback only when I feel I’ve accomplished everything I can by myself. Initially, I show my work to a group of between three and six ‘first readers’ who I will tell me honestly (or at least relatively honestly) what they think. Writing groups are a great way to go if you trust the other members. In this instance, trust has two main aspects: you need to trust the other group members to be honest without being unkind, but you also need to trust that they’ll give you good advice. It’s also important to find a team of ‘first readers’ who are likely to have relatively representative views – and the ability to articulate them clearly. Don’t be afraid to share your work online, but do consider doing it via a subscribers- or members-only group rather than an open forum. Always put a little copyright notice like this © Alexia Casale 2013 at the top and bottom. Anything you write is automatically copyright anyway (even personal letters are! ), but it never hurts to remind people that this is the case. For scripts, consider registering your work with the Writer’s Guild of America. A good rule of the thumb is that if you post work online, someone may steal it to repost online, but rarely will they steal it to publish it for money. The main thing to be wary of isn’t the possibility that someone might steal your work: the biggest danger lies in getting feedback from people who are only prepared to offer praise. Praise is very nice, but it won’t help you improve your writing. ‘Praise and only praise’ is great when you’ve just started showing people your work and don’t intend to pursue publication. If you are interested in getting published, then it’s a different kettle of fish: if you’re serious about publication, then the more criticism, the better. It can be emotionally draining but it’ll make all the difference to your writing. It’s often a good idea to ask for feedback on specific points. People who aren’t used to giving feedback will find it helpful to know what type of input you want: often they’ll be more forthcoming if they know where to start. Pick between four and six things that you want the reader to focus on. Remember that you can always ask different people to give feedback on different points. If you’re not used to getting feedback, and/or are terrified about what people will say, why not spell out what sort of feedback you’re willing to receive? If you find you can take more criticism than you thought, you can always push the reader to be more forthcoming. It’s better to limit things initially than shy away from seeking feedback at all. Another thing to consider is how you pick people to approach for feedback. It might seem sensible to pick someone who is likely to enjoy your work, but feedback from someone who isn’t a natural ‘fit’ for the project can often be particularly insightful. Apart from anything else, it’ll give you an indication of how narrow your readership is likely to prove. If you’re serious about developing your writing skills, critical feedback is vital. But remember that timing can make all the difference between feedback being helpful and counter-productive. Never submit to an agent or publisher without seeking feedback first, but do say no if friends, family or colleagues push you to show your work before you’re ready. Just be honest and explain that there’s no point having them point out errors you’re aware of: their feedback will be much more valuable when you’ve achieved everything you can by yourself and only outside input will help you move forwards. 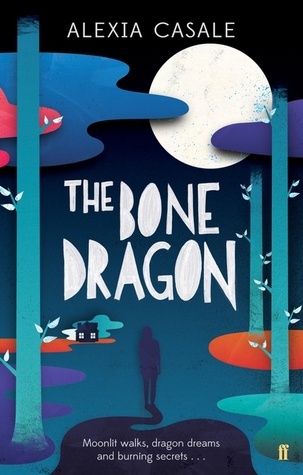 You can read more about the book and Alexia on The Bone Dragon website. This sounds really cool. Awesome post! The cover is gorgeous. I totally understand what the author is explaining about feedback. I wrote a lot when I was younger, and I always kept it to myself because I was afraid of negative feedback while I was developing the story. You kind of have to do your own thing for a while until you feel that you're finished.